Junior Noelle Resignolo runs in the October 2017 regional high school cross-country race at Frisco Adventure Park. 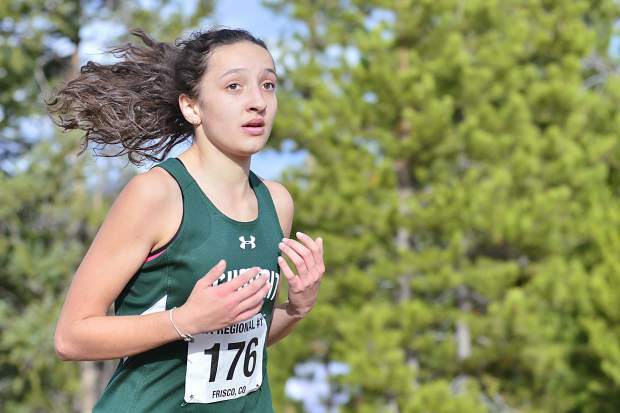 On Monday, Resignolo found out she qualified for this weekend's high school state championship track-and-field meet at Jefferson County Stadium in Denver. On Friday, Resignolo will compete alongside the state's 17 other top competitors in the 800-meters, at 12:55 p.m.
Over a 48-hour span this weekend, Summit High Tiger track star Noelle Resignolo went from a runner’s low to the greatest highlight of her track-and-field career. Monday afternoon, two days after she missed a would-be state championship qualifying time of 2:22.19 in the 800-meters, the Summit High junior got word that she indeed was selected to run in this weekend’s state meet after all. Resignolo compared her Monday afternoon to attempting to secure concert tickets online — refresh, refresh, refresh. That’s because she was waiting to see the Colorado High School Activities Association release the official list of state meet selections for the 800-meters. Heading into Monday, Resignolo knew her season-best time of 2:22.36 in the 800-meters wasn’t enough to meet the 18-runner cutoff for the state meet, based on season-best times alone. And though she won the 800-meter race at Saturday’s Rangeview Raider Last Chance Qualifier in Aurora — with a time of 2:24:00 — Resignolo knew she wouldn’t qualify for the state meet cut-off time without a couple of other runners ahead of her dropping out of the race. But that’s precisely what happened on Monday, as a pair of Battle Mountain runners, who also qualified for other state meet events, elected to not race in the 800-meters this weekend. With the dropouts, all of Resignolo’s hard work this year — particularly her focus on mental strength and pre-race preparation — paid off, as she put herself in a position to be picked. The scene Monday afternoon at Summit High was that of Resignolo, Summit Track coach Kristy McClain and other coaches refreshing the CHSAA website for the news they were waiting for. But with the finalization of the 800-meter state meet competitors delayed, Resignolo headed home still uncertain. “So I thought, ‘Get some rest, maybe I’ll find out if I make it today or maybe I’ll find out if I make it tomorrow,’” she said. Right before she pulled into her driveway, a text came from Coach McClain. With the enthralling news, Resignolo burst through the door of her home screaming to her mother. The emotion of the homebound scene was very different from Saturday’s scene in Aurora. Heading into Saturday’s meet, Resignolo was as focused as she’s ever been to achieve a specific time. That time was 2:20.00 — more than two seconds faster than the time she needed to qualify for states. Beyond that, Resignolo wrote on her arm the splits she was aiming for during Saturday’s race. At the 200-meter mark: 35 seconds. At the 400-meter mark: 109 seconds. At the 600-meter mark: 144 seconds. And at the finish: 2:20. But as Resignolo sprinted down the home stretch, far ahead of her nearest challenger with just 50-meters to go, she saw the race timer slowly creep up. It went from 2:17, to 2:18, to 2:19 and, finally, 2:20. “In the moment I thought, ‘I have to push it, I have to push it,’” Resignolo recalled. “But once it reached 2:22, I knew I was done. Or so she thought. Come Friday at 12:55 p.m., Resignolo will line-up in the blocks alongside the state’s 17-other top 800-meter girls runners who elected to compete. It’ll be a return to the state meet for Resignolo, who qualified two years ago as a freshman along with three then-Summit High seniors in the 4X800-meter relay: Ruthie Boyd, McKenna Ramsey and Megan McDonald. But it’ll be her first appearance as an individual. Two years later, Resignolo is now one of the top veterans on the Tigers team. And come late Friday morning at Jefferson County Stadium, Resignolo will go through her typical 45-minute pre-race routine. She’ll thrown her hair back in an easy ponytail or french braid, take two or three laps around the field and then enter into her active stretches. Then, right before the race, she’ll consume her preferred GU energy packets from Vertical Runner Breckenridge before entering into her “speed-ups” — quick little bursts of sprints. And then, when she takes her mark, she’s confident anything is possible.